We are back in Nairobi after a week in the field recording material for the pilot phase of the Singing Wells project. This was a culmination of months of planning and exchange of email correspondence between Abubilla Music and Ketebul Music. Jimmy and Andy from Abubilla Music, came to Ketebul Studios for a pre travel briefing and to go through the new equipment and software with Ketebul Music engineers on the afternoon of March 27th. They had flown into Nairobi from London the previous evening. I must confess we started off on the wrong footing: all Ketebul engineers were late for the briefing..! Tabu was especially not pleased about that, and Jimmy kept reminding me that I wrote the itinerary and programme (which he said was well written), and should actually take some time to read it (bear in mind that I am the official ‘guy to choke!’). All in all though, when I made it to the studio, Andy gave me a detailed briefing on all the equipment and a quick run through on Pro Tools. It was pretty impressive, the equipment, two mobile units in easy to carry travel cases, each equipped with a MacBook Pro laptop running on Pro Tools 9, MOTU traveler interface, a 500mb external hard drive, and 2 ART headphone amps. There was also a 2 bags with mic and instrument cables, power extension cables, 8 pairs of headphones, mic stands, boom poles, 2 Rodes NT5 mics with dead cats (no animals were harmed in the acquisition of the dead cats! ), 1 shure sm58 and 1 shure sm57 mic, and 2 AKG C414 mics. Patrick, our video guy, also made it to the studio a short while after me, and Jimmy had to almost beat him off with a stick to keep him away from his (Jimmy’s) Canon 5D camera. Pato was drooling all over it, and we had to pry it off his hands with a crowbar! The second four wheeler for the road trip was delivered, and Maddo, chairman of Ketebul Music board of directors, had to drop off the owner who intended to test Maddo’s skills behind the wheel. Tabu took off with Jimmy and Andy and headed to Sippers for drinks and dinner and a musical performance by Samba mapangala, Winyo, and Ayub Ogada, that he had organized to welcome our friends from Abubilla. We all joined them later, and I couldn’t believe how late it was when we finally left to go home. Jimmy made a point to check with me whether I knew when we were to depart from Nairobi according to my itinerary. Yes, Jimmy can be a funny guy. 4 and half hours and 322 km later, we made a stop in Voi town for lunch. Everyone had some food apart from Tabu. I have known Tabu since 2005, and I can count the number of times I have seen him having a meal on 1 hand! After refueling car number 02 (it must have been guzzling the fuel because of the AC), we set off for the second leg of our journey, Voi to Mombasa. Salif Keita’s ‘M’bemba’ CD and Winyo’s in production CD ‘Benga & Blues’ proved to be the favorite cruise music as we kept on switching between the two. Though I must admit I was riding shotgun and had control over the car stereo and I was just playing two of my favourite CDs. No one objected to my choice of music so I guess they all liked it! The cold tusker s we picked in Voi also helped to while away the hours. Unfortunately for The Leader and The Guide, he was the designated driver, and could only enjoy the sight and sounds of us downing the tuskers. We finally made it to Mombasa a little after 7pm and it was unanimously decided we proceed straight to Malindi, our third and final leg of the trip. Tabu in car number 01 had the pedal to the metal and was almost 45 minutes ahead of us. My guess is finally the hunger had kicked in, and he couldn’t wait to get to Malindi and some food. We made it to Malindi around 9.30pm. No one knew the exact location of Paradise Hotel and The Leader and The Guide’s GPS couldn’t help us either. Luckily for us, while we were refueling car number 02 at Watamu, a friend of Pato’s who lives in Malindi just happened to come by the station for fuel too. He took us to Paradise Hotel (which turned out to be a disappointment for all), where we found Tabu and his team had already arrived and were a couple of tuskers down. After unpacking all the equipment and checking in to our respective rooms, Pato ,Winyo, Willie Bembe and I set off to get diner for everyone. The restaurant at Paradise had closed already, so we had to get some take out from elsewhere. It was pizza all round except for Winyo and Tabu who opted for chicken and ugali. Breakfast the following morning and it was clear from everyone that Paradise Hotel was not living up to its name. From broken bathrooms and leaking toilets, to malfunctioning ACs (do note that the temperatures in Malindi at night were around 31°C and humid), Paradise Hotel scored a minus 4 on the 1 to 10 scale, 1 being disastrous. Despite all the mishaps with the Hotel, we were all excited to be heading out for our first day of recording. But first we had to change a flat tyre on car number 02. Half an hour or so later, we were all geared up and ready to go. Jesse, who had just arrived after taking the night bus from Nairobi to Malindi, joined us in car number 02. First stop was Watamu at the fuel station to fill up the cars and Jenny, our beloved and reliable generator, and also to pick up our man on the ground, otherwise known as The Fixer, Deche. He had been on the ground in Malindi, Kilifi, Kaloleni and Kwale, a week earlier, liaising with the groups we were going to record in the villages. We then proceeded to Gede stopping briefly on the road to pick up Bado, the son to Mzee Nyere wa Konde, singer and group leader of Mwanzele Nyere wa Konde Music Club in the village of Sita. We quickly identified our recording station that would work well for the sound and also provide the perfect backdrop for the video. Then it was all hands on deck, putting up the tent, setting up the recording station, and powering up good old Jenny as the performers got ready and took their position. When we finally got to recording, the sound was amazing. The equipment worked better than expected, and the performance by Mwanzele Nyere wa Konde Music Club was out of this world. They performed three songs in the Mwanzele style, a polyrhythmic groove heavy on shakers and punctuated with foot stomping and clapping. Andy manned the recording station, giving us Ketebul engineers a practical run through of the equipment. A moment of magic followed their performance when they were joined by Winyo on an impromptu off the cuff performance. The blend of Winyo’s guitar and melodic voice with their harmonies and percussion cannot be adequately described with words. This was then followed by a performance by Zaire Ndidingwa led by Fundi bin Kalale. They called their style Ndidingwa and consisted of shakers and a whistle. Just when we thought we were done for the day, Bado (ironically bado in Swahili means ‘not yet’) stepped up and asked if he could record a vocal performance that could later be developed into a song. Andy set him up with a click track and he laid down a vocal track. Magic moment number two occurred when it was suggested that his dad, Mzee Nyere wa Konde, laid down some ad libs on the same recording. One thing led to another and Winyo also joined the recording which turned out to be an amazing recording. Just before we left Sita, we were welcomed to generous helpings of ‘madafu’. This is the juice from almost ripe coconuts, a delicacy in the coast of Kenya. Then it was back to Malindi after a touching farewell from Mzee Nyere wa Konde. We made another stop at the fuel station in Watamu to get the flat tyre fixed. Maddo and I stayed behind to wait for the wheel to be fixed while the rest of the lads jumped into a tuk tuk (3 wheeled motorbike taxi) and headed to the hotel. Fast forward to the next day, everyone was glad to be checking out of Paradise Hotel. It was going to be a pretty long day; our itinerary for the day was to start in Kilifi to record 2 groups then drive all the way to Kaloleni in Mombasa for another two groups. Time was of the essence, so an early departure was in the books. Breakfast was a quick affair and we were soon on the road to Killifi. We made a brief stop at Pwani University to pick up Deche the fixer and replenish our water supplies, and then proceeded to the village of Kibarani. Set up was done in a matter of minutes, as the village kids gathered around to see what we were up to. We were all mesmerized with the group’s last performance, when the gunda player displayed cat like agility with his high kick dancing similar to capoera. This was no simple feat considering that the guy looked to be in his late forties to early fifties! We quickly switched set for the benefit of the camera crew and recorded the second group of the day, Mzinga, who proved to be another of our favorites especially their lead singer, Alphonce Kazungu. He was a very passionate singer with an amazing voice. We had to remind him over and over to face the mic though, because he kept turning to join the rest of the group in their dancing which they called Kiringongo. This showed us the need to have lapel mics in the future, to enable the performers give their most natural and comfortable performance without compromising on sound quality. Mzinga were accompanied by a small wooden xylophone, the marimba. After four captivating numbers from Mzinga, we quickly pulled down the set and set off for our second location. The drive would take us to Mombasa,where we would end up in the most interesting set of all so far. Junda. We first drove in to what seemed to be a very busy township with a very steep and treacherous gravel road to drive on. Everyone was worried about where we were going to set up and record from. Katana bin Kalama, the flamboyant leader of Supaki Kalaza, one of the groups we were to record that late afternoon came up with a brilliant solution: he took us to their rehearsal spot, which turned out to be a dried out seasonal river bed. The stench of dead fish was overpowering, but visually, we couldn’t have asked for a better set.My first worry was where to place Jenny, the place was wide open and we didn’t have anywhere to shield Jenny and minimize the noise. We found a spot downwind behind some bushes, and Maddo parked car number 02 in between our recording station and Jenny, to try and break the path of the sound. Jimmy was concerned about the amount of human traffic we had already attracted. There were kids everywhere and we could see people coming down into the river bed from the village up above in droves. We set up quickly on the back of car number one, it was now early evening and the sun wasn’t blazing hot, so we saw no need to put up the tent. We were also trying to get some recording done before sun down so we wanted to get up and running ASAP. Supaki Kalazi played for songs in the Mwanzele style. Every now and then, a motorcycle would ride past, and we would all cringe knowing the sound would definitely leak into our recording. Then came what turned out to be everyone’s favourite group on the trip, Sengenya, led by Munyaka Chimenga. This group was bursting with such infectious energy and they kept going on and on like the energizer bunny! With two ngomas, a metal sheet plate played with two sticks, and such elaborate shakers on the legs of the male dancers, Sengenya played a very complicated mix of dance and percussion that had the whole crowd of almost 120 people applauding their every move..When we finally managed to get them to stop, they insisted on doing one last number for us to join them in dance. I was dragged into the dance and forced to expose my two left feet. Tabu and Winyo gave a good account of themselves with the shoulder shaking dance (which I must point out though is very similar to the dance style of the Lake Victoria region where both Tabu and Winyo hail from). Jimmy gave it his best shot while Andy and the rest of the lads suddenly became ‘busy’ with the equipment. This was an epic conclusion to a very long day. With just about half an hour of sunlight left, we quickly pulled down the set and set off to catch the ferry in Likoni, and cross over to the south coast. It would have been a short drive to Likoni, but Tabu missed a turn and we were forced to take a longer route to avoid getting caught up in the traffic. After a brief stop to refuel the cars, we finally made it to Likoni ferry, and joined a long queue of cars waiting to board the next ferry for the short crossing to the mainland. a much waited for, cold tusker. Breakfast the following morning was taken leisurely. This was our last day and our set was only 15 minutes or so away, so we could afford to take it somewhat easy. After breakfast it was the same routine again: marshal up the troops to Jimmy’s room for the equipment, and load it onto the cars. We then drove out to Diani, found an ATM for Jimmy and Andy to get some cash, replenished our water supply, and drove to our fourth and final village, Vuga in Kwale. walls, and the red earth was slowly creeping up on the sides of the walls. The first group of the day was called, Zigidigi Cultural Troupe, led by Matano Mwachiti. They had an array of drums and a calabash like instrument that the player blew into through a thick pipe and it produced an interesting bass sound. They also had a flute, the Chivoti and the player played some interesting melodies. The ladies in the group looked very happy as they danced and sang. And as soon as they finished, they were again joined by Winyo for another magical moment as we waited for the second group to arrive on set. When they arrived, we again switched the set for a different backdrop for the video. The final group was called Muungano Kayamba, They came with all manner of props for their performance, including a creepy looking life size baby doll that reminded me of Chucky. Their music was based on the Kayamba, a shaker common in most Mijikenda tribes. They performed a harvest dance which had one of the ladies carrying the creepy doll with the other ladies dancing around her. The three kayamba players laid down a very complicated and tight rhythm accompanied again with the chivoti. particularly good, and served as the perfect ending for the day. At the hotel, we quickly set up on the beach just outside Jimmy’s cottage, for a recording with Winyo and Andy. Pato and I then drove Winyo to hospital in Diani to have his tooth checked. He had knocked himself on the bed the previous evening, and his tooth was hurting. It was a long wait for the dentist at the hospital; he had gone for the day and had to be called back. When he came back, he referred Winyo for treatment in Nairobi seeing as there was no time for him to do a full procedure. The three of us then had dinner at Diani Campsite, a short distance from the hospital, and then drove back to the hotel. Everyone had retired to bed apart from Maddo, Deche, Willie Bembe, and Jesse. We joined them for a few tuskers before Deche and Jesse went out for a night in Diani. We had an early departure planned for the morning; we had to be in Nairobi at 7.00pm for a meeting with one of our prospective donors, so we soon all retired for the day. The following morning we checked out of the hotel and loaded up the equipment and luggage into the cars. This time around I joined Tabu, Jimmy and Andy in car number 01 to talk shop on the drive back to Nairobi. Deche rode with us to Mombasa where we dropped him off. agreement to proceed to Nairobi. Fast forward, 7.00pm in Nairobi. Our rendezvous for the meeting was Habesha, an Ethiopian restaurant in Kilimani. We had diner then proceeded to Jimmy and Andy’s hotel, Fairview, for the meeting and to return car number 02. Exhausted from the long drive and the project in general, I went home for a much deserved rest. The final day of the project, was spent at Ketebul Studios, recording 71 Hours to Monday, an Abubilla song that they feature artistes from wherever their travels take them. While Andy recorded Bishop on bass, Winyo and Makadem on vocals, and the legendary Ayub Ogada on nyatiti, Jimmy met with Joy of the Godown Arts Centre to share his views on the centre. Later he shared with me his thoughts on the direction to take when compiling the material collected for output on DVD, CD, and booklet. Soon it was time for Jimmy and Andy to leave and catch their plane back to the UK that evening. We dropped them off at the airport, not saying goodbye but see you later. The main Singing Wells project is set for November, which is just around the corner. The Singing Wells is a project dedicated to the preservation of Kenya’s music heritage at its very heart (read more on the Singing Wells here). Ketebul Music and our partner Abubilla Music (www.abubillamusic.com) will today embark on a trip to Malindi on the pilot stage of the project, aimed at putting the equipment and the personnel to the test. Jimmy Allen and Andy Paterson from Abubilla Music join Ketebul Music personnel on a 5 day moble recording trip of the Kenyan Coast. Equipped with two mobile recording units and top of the range software, the Singing Wells project is definitely off on a good start. 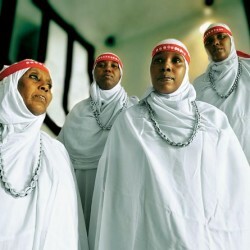 Due to some concerns that have been raised by various people on the usage of the name Bismillahi Gargar by the Somali women quartet promoted and produced by Ketebul Music, and in being sensitive to cultural and religious views, the group shall henceforth be known simply as Gargar. Welcome to the new Ketebul Website. It has been developed by Nebulo Strata as part of the collaboration between Ketebul and Abubilla Music.